GrumpysPerformance.com • View topic - MOST VERSITAL SHOP WELDER ????? MOST VERSITAL SHOP WELDER ????? now just to answer some basic questions, heres some info from a different site you might want to know! I'll try to cover some of the basics for you as best as I can explain them. This process is the toughest to learn. 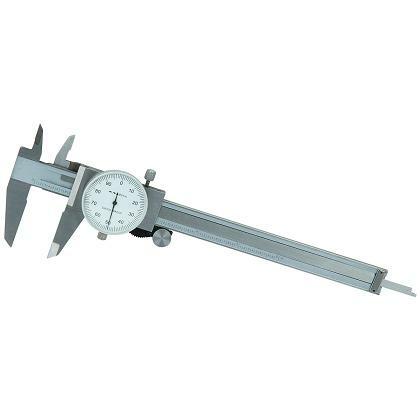 The electrode is composed of Tungsten, and a current is flowed through it controlled by either a foot pedal, a hand switch, or a fixed current on the machine itself. I am learning TIG using a foot pedal, the more you press down on the metal, the more amps you get. Once you get enough current flowing to get an appropriate sized weld pool, you start dabbing a filler metal into the puddle as you move the electrode further down the work piece. 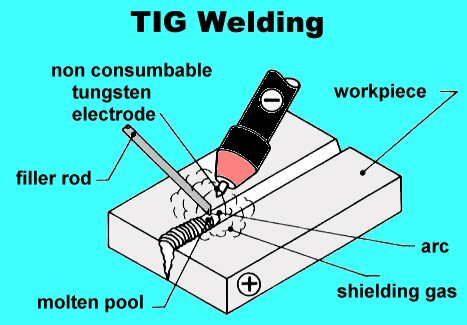 TIG allows you a great amount of control because you regulate how much current the electrode gets and how much filler metal the weld pool gets. This process is very slow compared to the other types though. even the $20 import version is accurate enough for that use! 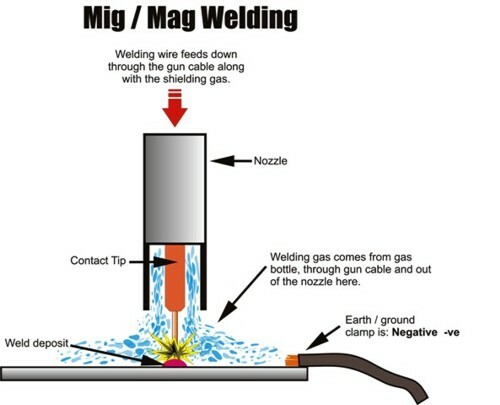 MIG is the easiest process of welding. 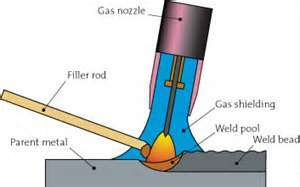 A feeding gun is used to feed a spool of filler metal wire into the weld pool. Current is usually switched on and off by means of a trigger on the gun. Amps are usually controlled by a dial on the MIG machine itself, meaning that you cannot adjust current in the middle of welding. Though, with some machine you are able to get a foot pedal to control Amps while welding. 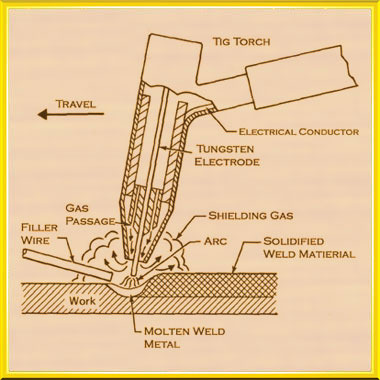 Arc welding is mostly used in industrial applications. 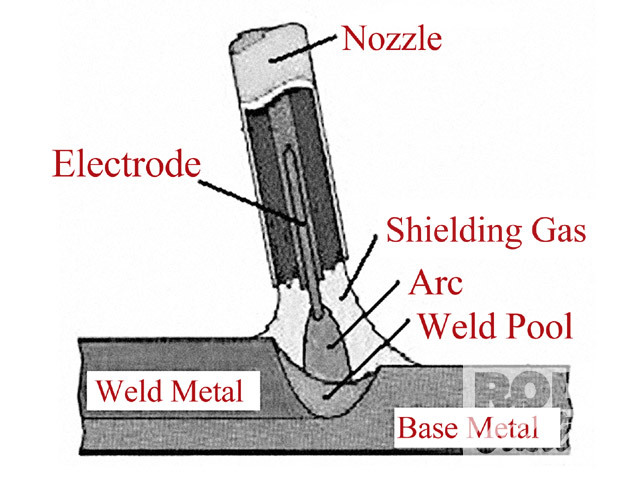 An electrode is used to strike an arc, the electrode then melts away to deposit metal into the weld pool. The electrode is coated with a variety of different materials which are used to help keep the weld pool from being contaminated. 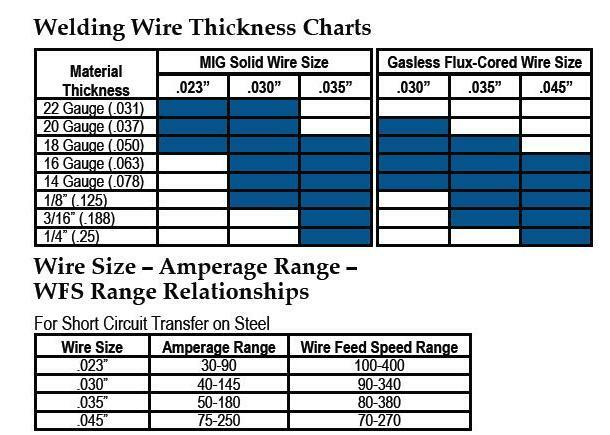 TIG and non-flux-cored MIG both use a variety of different shielding gases to help keep the weld pool from being contaminated depending on what metal is being welding. Always think thru your goals when you purchase equipment,the rough rule as a guide is youll need about one amp per .001 inch of material thickness to well aluminum effectively, IE youll need about 250 amps to weld 1/4" thick aluminum, now that is based on the idea of near constant use, naturally you can weld thicker material if youll allow less than a 70%-100% duty cycle, and as a general rule a 250 amp rated machine will operate at 70%-100% duty cycle at significantly reduced amps (lets say 180 amps as a guess) from its rated 250 amp max. "Take a welding class at the local community college, and learn to TIG before you spend the money. 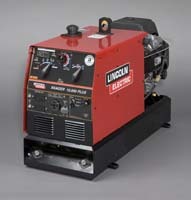 Just like any other machine tool, the welding machine is only about half the cost of getting setup to weld. Figure in if you are starting from scratch, that you'll go through two packs of tungsten, 40 collets, 8 cups, a pair of gloves, 30lbs of steel rod, and probably 8 tank fills on a Q size tank, before you are able to produce a consistent, clean, saleable weld. 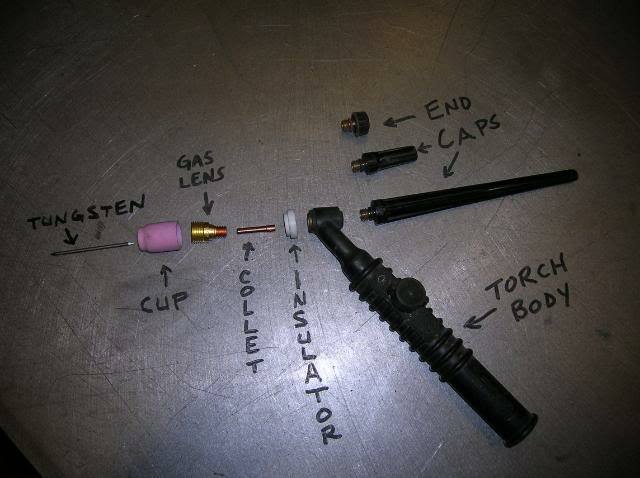 Now, if you take the TIG class, then you get to pay the 400$ and burn through as much in the way of supplies as you want...get as good as you want...and THEN spend the big money on equipment, after you've already spent someone else's money on materials learning. " Re: MOST VERSITAL SHOP WELDER ????? If you look around at local welding supply shops and local welding shops you will on occasion see great deals on used welders that get traded in or swapped on upgrades, a close examination will usually give you some idea as to its condition and the local dealer in that brand can give you an approximate age with its serial number and model, some welders have been used hard and constantly, but a surprising number spend a great deal of time just sitting unused in shops, I know of several shops that have several welders and most of the works being done with one or at most two welder, its not at all rare to find high amp rated mig or tig welders that have had little real use. 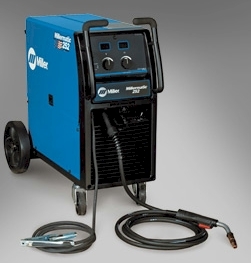 If your thinking of buying a shop welder Id strongly suggest a 220 volt 180-210 amp mig, or 220 volt 200-270 amp TIG will do about 90% of what most guys will ever do, if you get a MIG with a spool gun that can do aluminum, you have a rather versatile welder, but a good TIG is almost unbeatable in the versatility race, its a bit slower but it will weld almost anything, in skilled hands. Ive purchased several used welders, and had zero problems, but I always do a few test welds before I buy, one,If you can,t do that your best off avoiding the welder. and keep in mind ,that the main things you need to do, in deciding on a welder is making sure it meets your needs and that you have the electrical capacity to run it, stick to recently built name brands so you can get parts, anything over about 10 years old is usually hard to get parts for. the last couple guys I know who bought one said they were several hundred dollars less than a comparable miller or lincon TIG, and had a bit better features for the money. 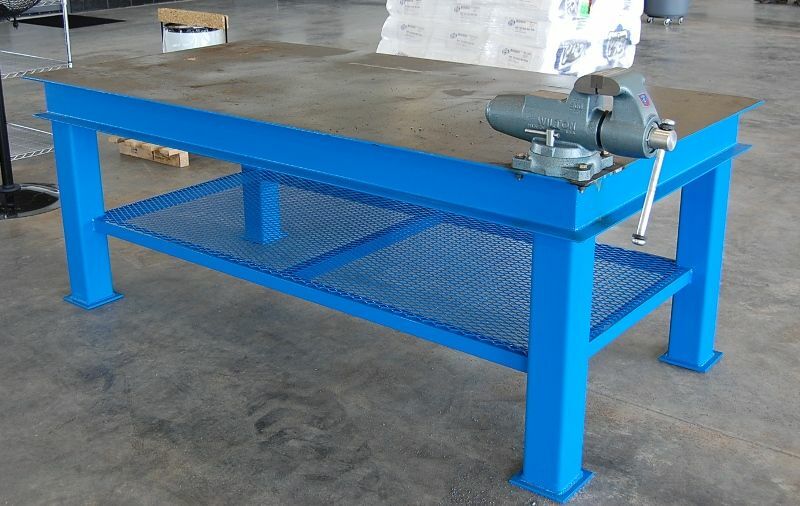 Call us at 800-USA-WELD (800-872-9353) for more information or to place an order. 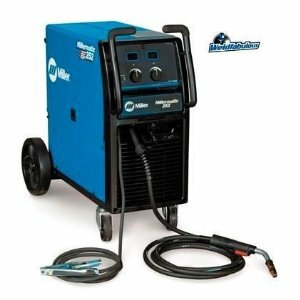 I have not seen one yet in person but a combo , MIG/TIG/ARC welder IF its well designed has some intriguing potential, and HTP is known for building a decent quality welder, I know several guys with HTP tig welders and everyone happy with those. 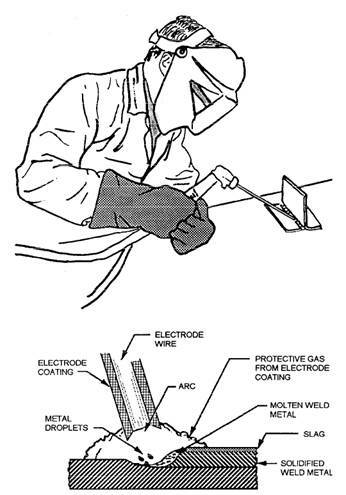 It only welds in DCEN (Direct Current Electrode Negative) which is cool because most of your welding will be DCEN. 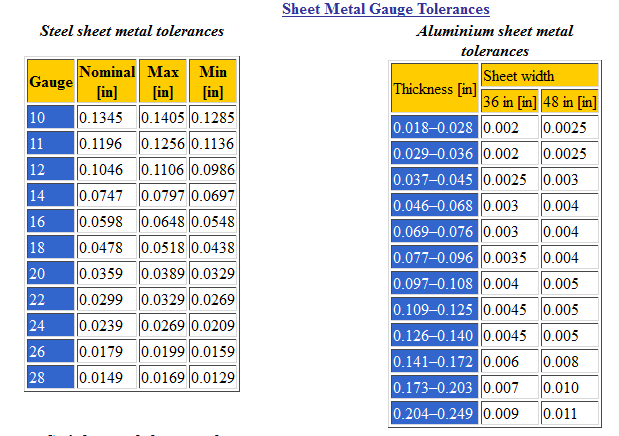 However, donâ€™t expect great results on aluminum which is best welded in A/C current mode. I have a TIG and unless I am welding aluminum or stainless I will reach for my MIG welder first. I think you would be better off buying a good MIG, master that and then decide if you even need a TIG. I like having the option of the TIG but donâ€™t really need it for the car but I have come across situations where it was the only option to restore an otherwise non-reproduction part. If you can afford 1,200.00 for a welder, buy a GOOD MIG and then if you want a TIG go get a good one with A/C, balance and pulse. BUT a good quality TIG is even better! I recently visited a local friends shop where he was having problems with his recently purchased , a $289 HF 180 amp mig/flux welder. but its rarely a good idea to buy a cheap welder,and theres a REASON why the better welders cost a good deal more than the cheap imports, now there are jobs that the less expensive welders are very useful on, and you surely don,t need a welder like I purchased for my shop, but looking at the difference will be informative! 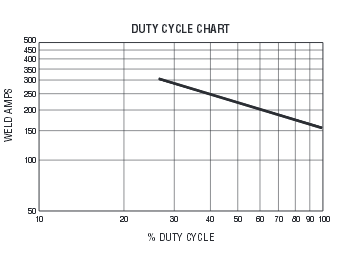 if you look thru the duty cycle specs on most welders youll quickly see why a welder that runs on 220volt vs 110 volts is preferred if your fabricating or repairing much of ANYTHING,that will require more than a few minutes of welding time, in most applications, youll also notice why the miller and lincoln 200-250 amp rated migs are preferred over the 120-145 amp imports that run on 110volts even with the huge price difference by most shops... that do welding frequently, rather than.. a low price welder that plugs into 110 volt outlets...those low cost 110 volt welders lost a great deal of its appeal or glamor if you need to repeatedly limit your welding to 2 minutes, maximum, then wait for 8-10 minutes before welding again, and can,t get repair parts easily at a local dealer. my brother-in-law seldom listens to my advice, and when he saw a 180 amp welder available for $300 at HF he jumped on the "BARGAIN PRICED WELDER"
what he failed to understand was that all mig welders have a duty cycle, and what that basically means is that you can,t weld continuously without the welder overheating and burning up, it needs to cool off between welds , if you purchase a welder, in my opinion, you should find one that has at least a 50%-70% duty cycle at the amp rating your most likely to use it at, so you can more or less weld fairly constantly without needing to wait for the welder to cool off between making brief welds. you would be amazed at the info included in an owners manual, and I,d bet 80% never get read! 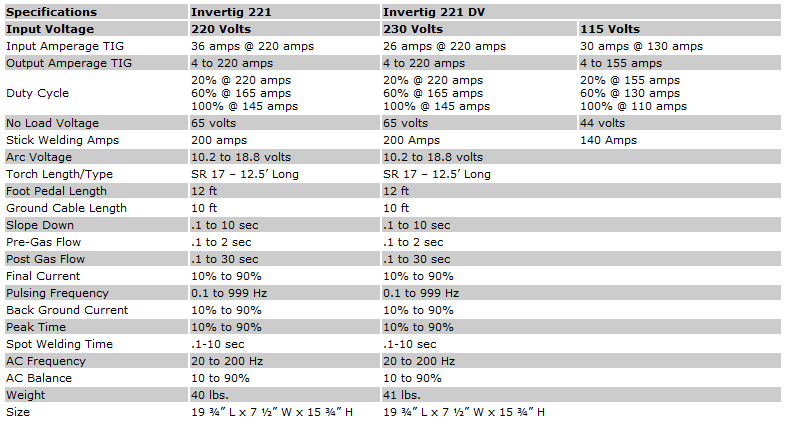 and remember that flux-core requires reverse polarity compared to MIG. now I freely admit thats a great price on a 180 amp mig welder but you also get what you pay for and a $289 mig welder is just that! now you obviously can,t logically compare my $2300 MILLER shop mig, to the $289 HF mig ,but look over the differences, with my miller shop welder you can weld almost constantly,keep in mind your never welding constantly because your changing locations , moving parts or clamps etc. but the better quality MILLER MIG that costs SIGNIFICANTLY MORE allows basically unlimited welding time at even 150 amps . the difference makes it all to obvious WHY you really need to research before you buy any welder and its a great idea to find and use one someone else has previously purchased to get a good idea of any welders capacity and limitations before you start dumping hundreds or thousands of dollars into a welder, and remember its not just the welder alone, you need wire, a gas tank, safety equipment , like a hood, and apron and gloves , clamps, and other components that can easily add a thousand dollars to the cost before you have a valid functioning welder. ...yes its a bit of overkill but Ive never regretted spending the extra coin, because long experience taught me good quality tools make work far easier, and after a few years you don,t miss the cash spent as much, as you regret buying crappy tools that need to be replaced, if you go the cheap route. 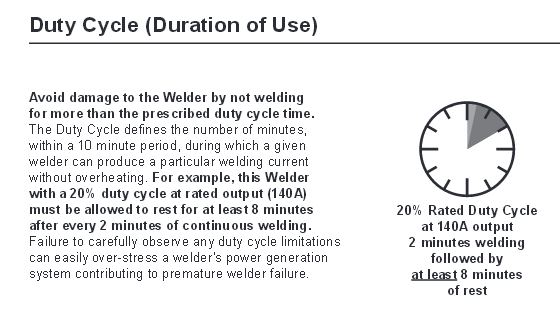 Re: duty cycle on welder. now obviously what type of work you do will determine to a great extent what would be the best match in a MIG welder to YOUR particular application, and it makes little sense to but a welder with capacity youll never use or one youll constantly be waiting on, to allow it to cool off. we all learn to work with the tools we own and eventually, I think. most of us come too think of the tools faults or virtues as the way EVERYONE DOES IT. Ive used those 140 amp welders and was actually rather impressed and well pleased with the results..well UNTIL I used a buddys MILLER 252 mig, and a friends LINCOLN 300 amp TIG welder , I think its a case of not knowing what your missing as much as the machines capability's. Not sure whats out there, but price is a big concern. I understand the concept of "you get what you pay for", but I don't even know how much use I'll get ( and I don't prescribe to the notion of "you find more stuff to do if you buy one."). 70-SS454 wrote: Millermatic 211 Autostart... One & Done...! It'll last your lifetime...!